Dave's been wanting to do a few Belgians for a while, so we've had a few vehicles done to scratch his itch! There's a couple more to come and then we'll have a look at doing some infantry and stuff to go with them towards the end of this year / early 2018 possibly. First up we've got the T-13 tank destroyer. This early B1/B2 version was built by Vickers and equipped with a hefty 47mm AT gun, mounted to the rear due to the layout of the vehicle and its centre of gravity. One downside was that the side armour had to be dropped to allow the turret to fully traverse, leaving the crewmen slightly exposed! Secondly we've got the T-15 light tank, again built by Vickers in the UK from 1935-1938 and armed with a 13.2 Hotchkiss machine gun. These were only used in small numbers, 42 in total compared to 300+ of the T-13's. 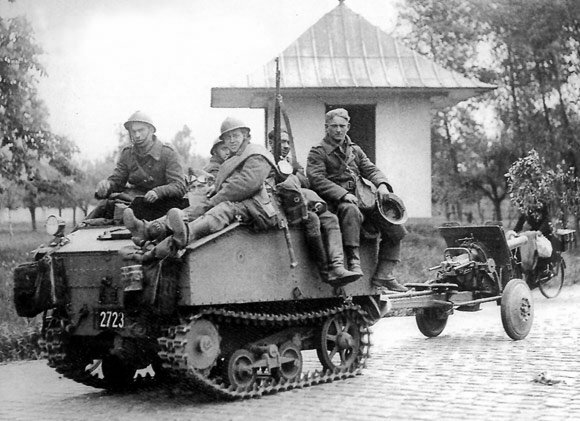 One interesting note is that these were not referred to as 'tanks' by the Belgian military/government, instead calling them armoured motorcars so as to not provoke Germany. And finally we've got the rather small Utility B tractor as well. This was originally the Vickers Utility tractor but this our model is the later 'B' version, licensed and produced in Belgium from 1936. Numbers built were under 300 in total. And of course some pics of them!